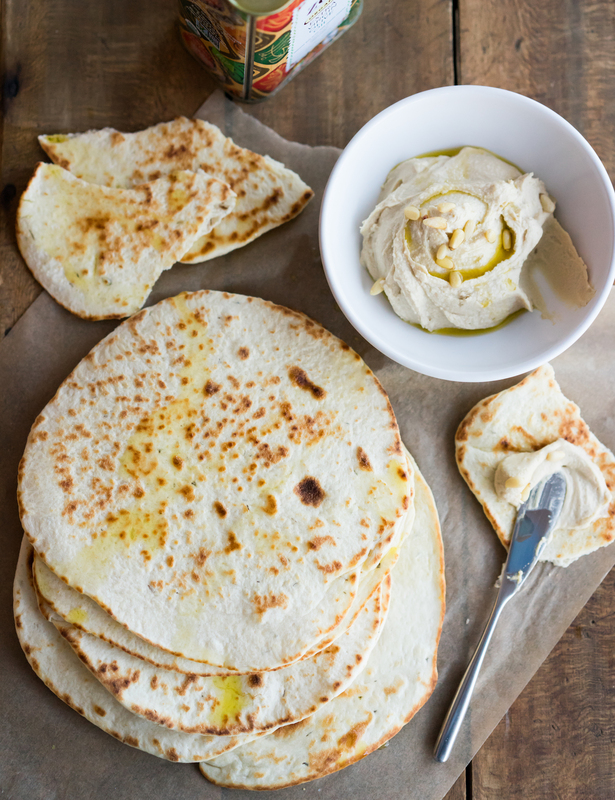 Store bought pita bread simply does not compare to home made. Not even close. And believe me when I tell you the home made version is actually easy to make! While it is a yeast dough, this recipe only requires one short rise so you can go from dough to pita in practically under an hour. And once you taste this, you will not want to eat the stuff in plastic ever, ever again. The pita we fell in love with in Greece a few years back did not have a pocket. 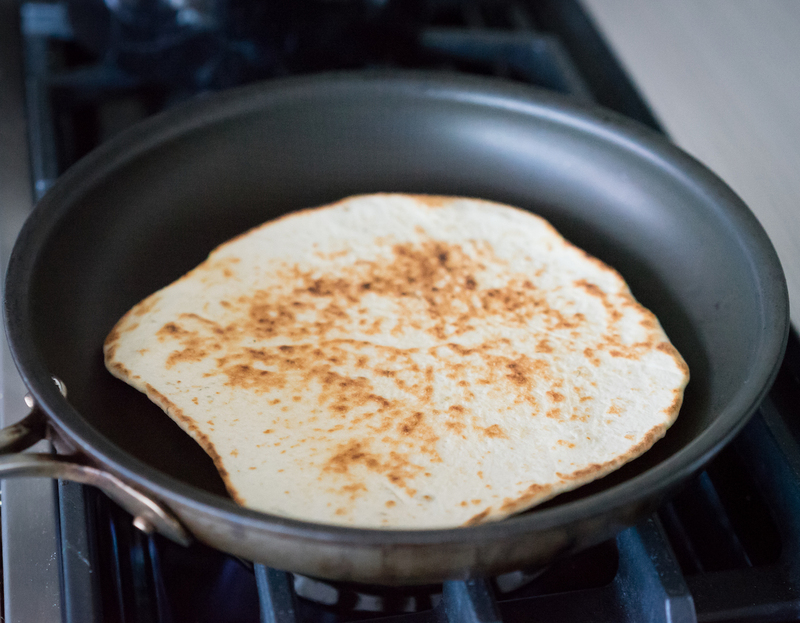 It was a fluffy Greek flatbread that was cooked in a cast iron pan over a flame, rather than in an oven. It was rustic and covered with charred bits and was drizzled in fresh olive oil as soon as it came off the fire. For this dough I used Napoli wheat flour Tipo “00” which has a 12.5% protein content and is finely milled. It’s used for pizza dough and works beautifully for pita bread. 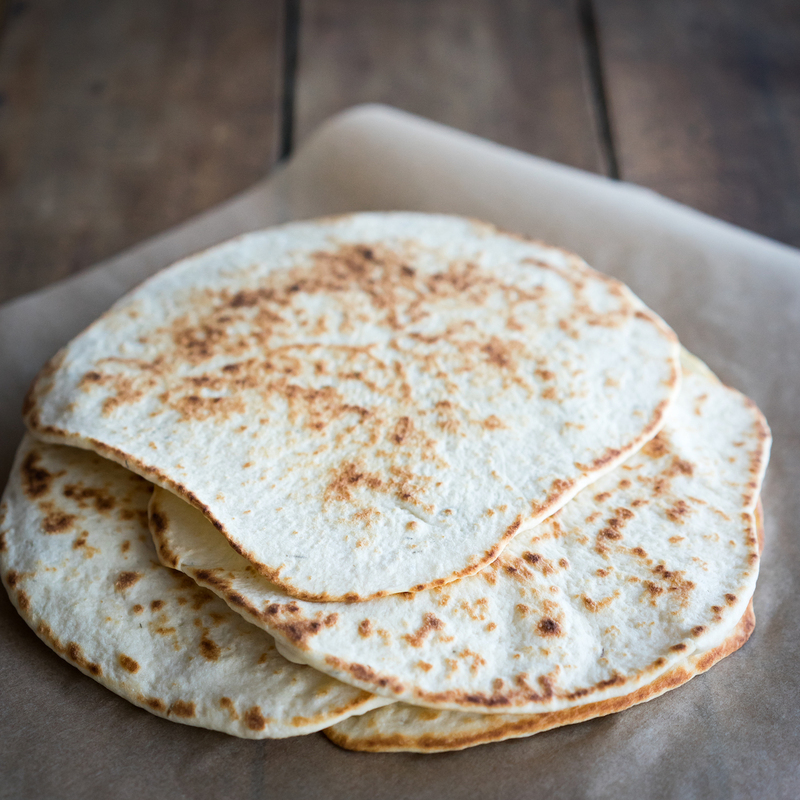 You can also use a strong flour, like King Arthur Bread Flour which has a higher gluten content than all purpose, and results in a nice, soft, flavorful pita as well. Once the dough is rolled, it cooks in the pan for only a couple of minutes and slides out with lovely browned and crispy spots. 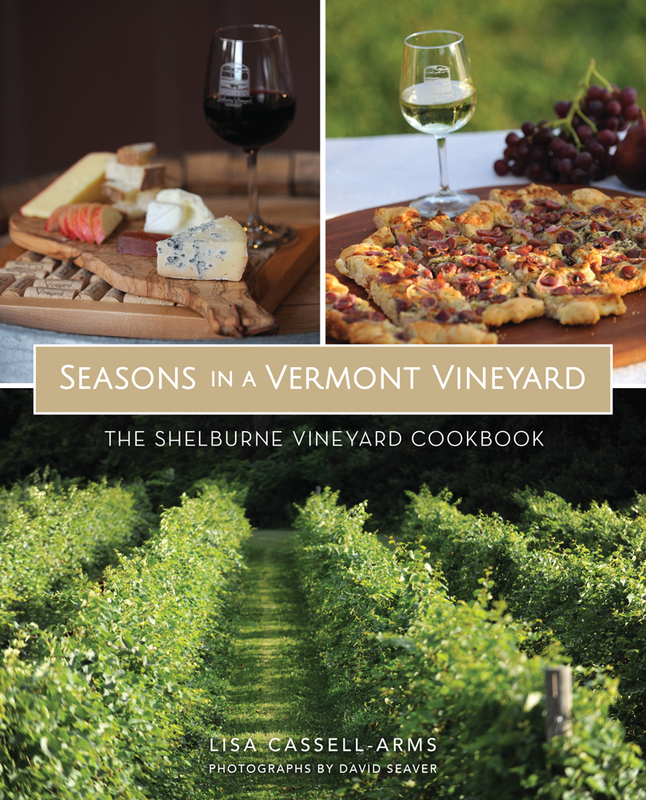 Use it as a vehicle to scoop up any number of wonderful spreads and dips, like hummus, tzatziki or whipped feta, or wrap it around spiced lamb kebabs and roasted veggies. 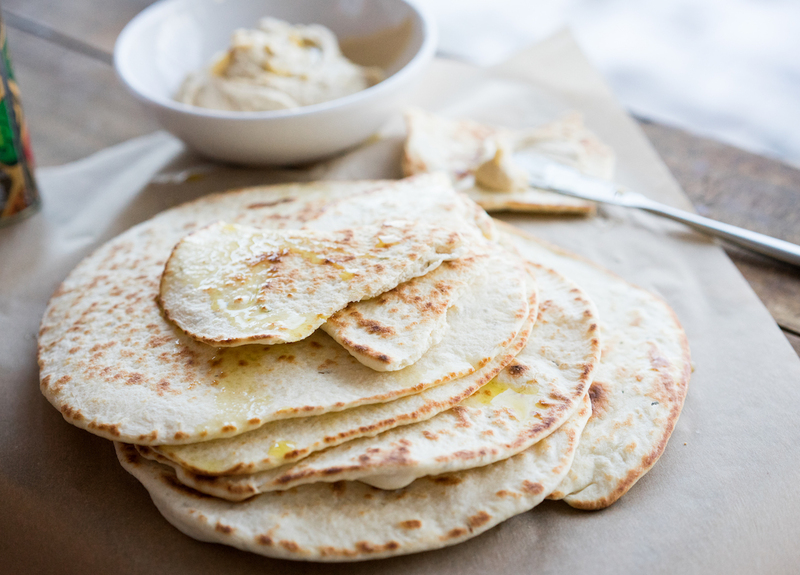 Home made pita bread will elevate any meze platter into something really special. In a large bowl, combine the yeast, sugar, milk and water and wait for a few minutes for the yeast to activate and little bubbles to appear on the surface. Stir in one tablespoon of the olive oil. In another bowl, combine the flour, salt, and herbs. In small batches, slowly add about 1⅔ cups of the flour mixture to the liquid mixture, stirring as you add the flour, making sure it is combined before adding more. If the dough is wet, add remaining flour. If the dough is dry, reserve the remaining flour to dust the board for kneading. Mix the dough well until the flour is completely incorporated into the liquid. Then transfer the mixture to a lightly floured board and begin kneading. Knead dough for approximately 4-5 minutes until it becomes very smooth and silky. Gather dough together into a ball, pinching it together on the bottom so the top is smooth. Coat a bowl with 1 tablespoon of olive oil and place the dough into the bowl, smooth side down to coat it with oil, then turn it over so the smooth side is facing up. Cover with a clean kitchen towel and allow the dough to rise for about 35-40 minutes until almost doubled in size. If you have a proofing setting on your oven, that’ll work great for this dough. Brush a clean countertop with remaining tablespoon olive oil and dump the dough onto the counter. Press it down to deflate and cut it into 6 or 8 equal pieces, depending on how large you want your pitas to be. 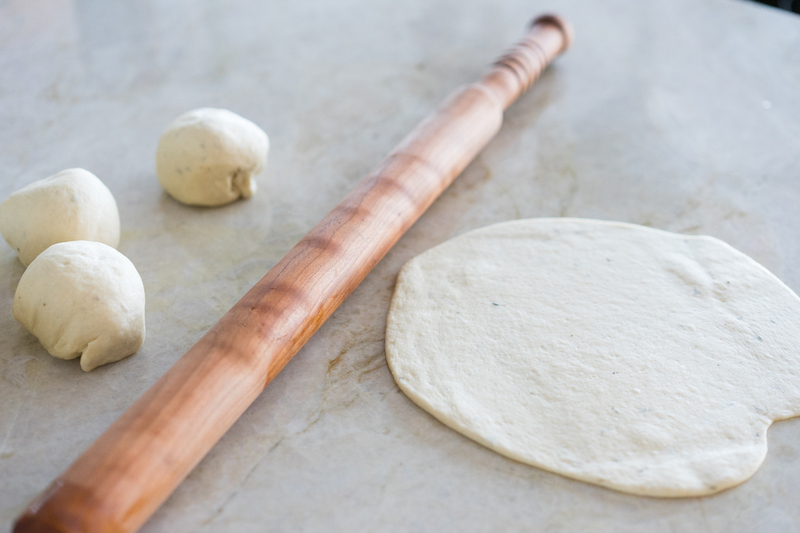 Using a rolling pin, roll each piece of dough into a circle, about 6 - 8 inches in diameter. Heat a cast iron or non stick skillet over medium-high. One at a time, place the pita in the pan and cook until bubbling on the top and browned on the bottom, about a minute. Flip the pita and cook on the other side until browned, another minute or so.